"FirstLight Federal Credit Union and the Sun Bowl Association recognized the need in our communities and have joined forces with Townsquare Media and the El Pasoans Fight Hunger Food Bank to help satisfy that need," said Sun Bowl Association Executive Director Bernie Olivas. "It’s a privilege to give back to the communities that we serve, and by partnering with the Sun Bowl Association, we want to collect as much food as possible," said Natalia Flores, Marketing Manager for FirstLight Federal Credit Union. "As we get closer to the holidays, we are asking the community to come together and donate to the El Pasoans Fighting Hunger Food Bank and Roadrunner of New Mexico, so they can give directly to those in need." Those donating can register to win a prize pack of four tickets to the FirstLight Federal Credit Union Sun Bowl Parade breakfast and two tickets to the 2018 Hyundai Sun Bowl football game on Dec. 31, 2018 at noon (MT). Donors can register at any of the FirstLight branches as well as the SBA Office. The last day to donate and to register to win is Nov. 5. FirstLight and the SBA encourages donors to "give the good stuff," meaning that donations should include the type of food that have the most impact at a pantry-such as peanut butter, canned tuna fish, and canned vegetables-rather than less nutritious snack items or even simply those foods from the back of the cabinet that rarely get eaten. 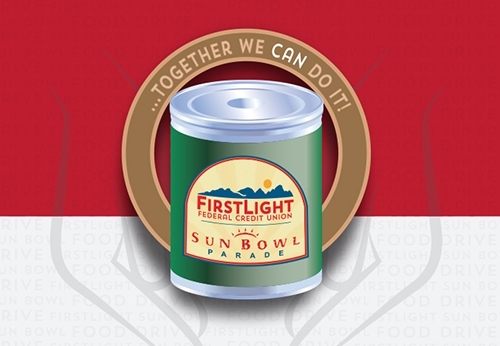 Supporters and donors can keep up with the success and excitement of the FirstLight Sun Bowl Food Drive and all the efforts of all participants by following on Social Media (Facebook: Hyundai Sun Bowl & FirstLight FCU; Instagram: @HyundaiSunBowl and @firstlightfcu). To make your monetary donation online, please click on the food bank of your choice and donate on their website.